Los Angeles, what can I say? It’s time to pay you tribute! As most of you know, I have been living in L.A. (or Venice Beach to be more exact) for almost two years now, and we (Guille, Papi and I) have received our share of visitors. We’ve taken them many places and visited all the popular attractions. So, I thought I would let you guys in on my favorite things to do in this magical City of Angels when visiting for the first time! 1) Griffith Observatory – This is my ultimate favorite tourist attraction in Los Angeles, and it’s completely free! Depending on your time, you can either hike all the way up to the Observatory or you can just drive up and park there (Parking is also free). The Observatory is located on top of Mount Hollywood, and you get to see amazing views of the Hollywood Sign and all of La La Land + the actual building is a beautiful art deco landmark with a planetarium and public telescopes. If you are a movie nerd like my sister, you might recognize Griffith from the scenes that take place here in Rebel Without A Cause, James Dean’s most famous film; there is a monument of the iconic bad boy on the west lawn of the Observatory for all your picture-taking needs, as well. Also, make sure to stop at The Trails Cafe on the way up or down! It’s a small coffee stand that sells delicious pastries, pies, and an extraordinary avocado sandwich. There’s outside picnic style seating, and I think it’s a great little “hidden” gem and an absolute must stop when visiting the observatory. 2) Right after visiting the Observatory, you should head on over to the TCL Chinese Theater (only 15mins away from Griffith park!) and stroll around the historic Hollywood Walk of Fame. 3) Beverly Hills – Walk around Rodeo Drive and see all the amazing Haute Couture boutiques such as Fendi, Hermès and Gucci to name a few. Then head on to the Beverly Hills sign and take your photo. If you have time, driving around the 90210 is a pretty entertaining and scenic tour of mansions and endless palm trees (Very L.A!) Then, go visit the LACMA museum where you’ll find the famous Urban Light sculpture by Chris Burden. 5) DTLA – When in downtown, go to The Broad Museum. It’s also free, but very popular right now with very long lines to go in (up to two hours) if you don’t have advanced tickets. My advice, if you didn’t reserve your free tickets ahead of time, get there before they open and you will most likely have guaranteed entry and won’t wait as long in queue. I always like to take people over to Grand Central Market for lunch + the Ace Hotel Upstairs rooftop for drinks. 6) The DTLA Arts District is likewise a cool part of town to walk around. Get some beers at the Arts District Brewing Company and the Angel City Brewery (both walking distance from each other) and then grab some dinner at Eat Drink Americano, Unami Burger, or Gratitude Café. 7) Santa Monica – In downtown Santa Monica, visit the Santa Monica Pier, walk and do some shopping at the Third Street Promenade, and grab something to eat! There are so many different options around, but I HIGHLY recommend one of the best sushi places out there: Sugarfish! Also, do yourself a favor and order the TRUST ME menu. This place has AMAZING sushi and due to the small size of the restaurant, they don’t accept reservations. However, the good thing about this specific location is that you can give your name and number and then walk around (3rd street promenade) get drinks, do some more shopping, and then they'll call you when your table is ready. 8) Santa Monica Main Street – also make sure to visit SM Main Street. There’re some other cool shops and restaurants and Urth Caffe is there! Urth is a true L.A. staple, best known for its delicious coffee and pastries. I actually eat at Urth often and love it for any occasion (breakfast, lunch, dinner.) The Spanish latte is one of the best lattes I’ve ever had and everything on the menu is delicious! 9) Venice Beach– So I’m going to be biased here and say this is the best area of L.A. (lol I truly love my neighborhood!) and I have a GIGANTIC list of suggestions on what do to, see and eat, so I’ll soon share just a Venice Beach Travel Guide with ALL my insider tips. 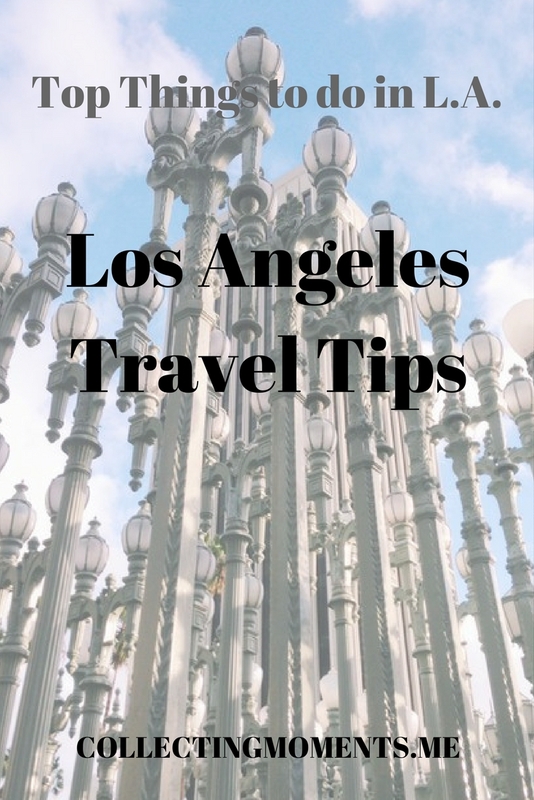 But, the main things to do when in Venice are definitely walking around Abbot Kinney Blvd, visiting the VB boardwalk and skate park, and strolling through the Venice Canals. For food, make reservations at Gjelina, or eat at my favorite casual spot Wurstkutche. Also, the rooftop at the Erwin Hotel is amazing to watch the sunset by the beach accompanied with some yummy cocktails! P.S - If looking for some sweet treats, Blue Star Donuts is my go-to spot! Please make sure to share this post if you liked it and others will too! Thanks!